Use the form below to contact tour Tra Su Sanctuary bird 1 day tour with motorbike and sampan directly. Mekong Delta Tours is honored to introduce visitors our Tra Su Sanctuary bird 1 day tour with motorbike and sampan for sightseeing. If you want to see Mekong river, do not miss visiting the Tra Su Sanctuary bird. 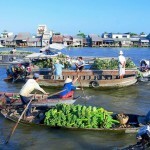 These floating markets give travellers experience in Mekong river and Sanctuary bird is an amazing destination for paying a visit. For those people who like animals and natural landscapes, Sanctuary bird has not only its almost-untouched natural beauty but also its sanctuary of flora and fauna. Let’s take a boat trip into the jungle, you will immediately feel like you are harmonizing with nature here due to all of the remarkable images of cajuputs, the beauty of the flowers and the music-like noise of birds, insects and animals making people relaxed and feel comfortable. At 06.00am, visitors will meet your local motorbike driver at the meeting point and start to depart for Tra Su Sanctuary bird. Tra Su cajuput jungle, which is famous for not only its almost-untouched natural beauty but also its sanctuary of flora and fauna. 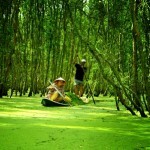 Let’s take a boat trip into the forest, you will immediately feel that you are harmonizing with nature thanks to many remarkable images of cajuputs, the fragrance of the flowers and the music-like noise of birds, insects and animals all that makes travellers relaxed and feel more peaceful. From the observation post, you can see the forest with an area of nearly 900 ha, which is home of many kinds of birds and animals, consisting of some rare ones. Have lunch in the forest. Then take a nap on a hammock. 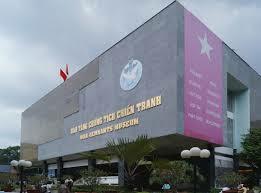 In the afternoon, return to Chau Doc town. 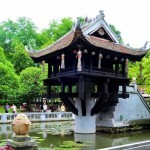 Pay a visit to Xu lady temple, Sam mountain and Caved Pagoda. 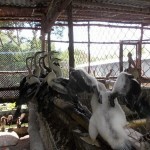 The Tra Su Sanctuary bird 1 day tour finishes at 16.00. Thank you for visiting our Tra Su Sanctuary bird 1 day tour with motorbike and sampan for sightseeing. We are looking forward to serving you.